Profiles allow you to set custom measurement goals to analyze your emails against metrics such as page views, conversions, open rates, CTR and unsubscribe rates. Create email scoring profiles to guide you through optimizing emails and campaigns. Navigate to the Profiles tab underneath "Manage Emails." Click the red "Create New" button at the top right side of the page. 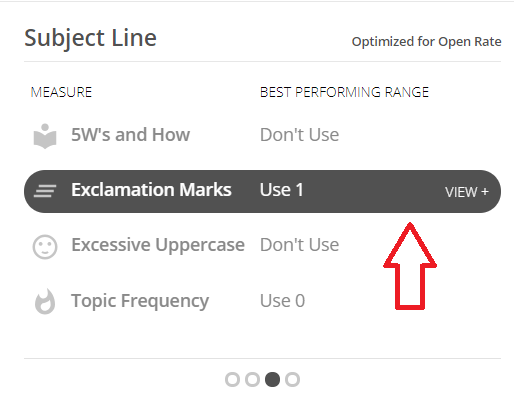 Select your preferences for Subject Line Engagement. Once you make a selection your preferred metric will appear on the top right side of the screen. To modify, simply click "edit." Select your preferences for Body Engagement. Once you make a selection your preferred metric will appear on the top right side of the screen. To modify, simply click "edit." Campaigns: Select the campaigns you would like to include in the profile. The recommendation is to include campaigns with similar goals. Using the check boxes located to the left of the campaign name, select all the campaigns you would like to include and then use the "Add Selected" button. Choosing "No Campaign" will include all emails not tied to a particular campaign. Please note that the "Add Selected" button will only appear after you have begun selecting campaigns. 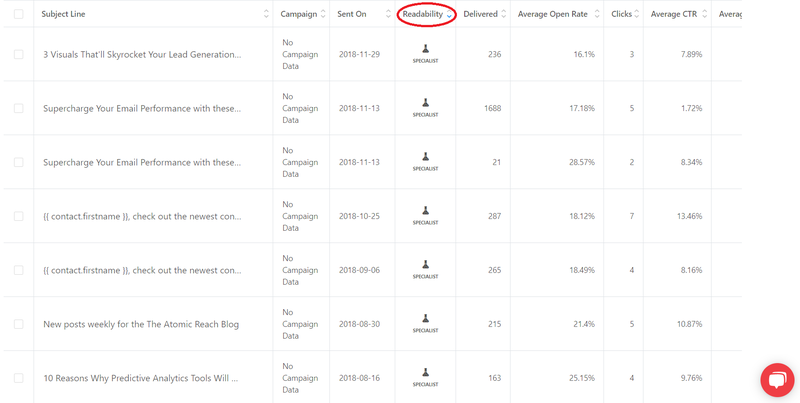 If you selected a campaign in error, you can edit this list by checking the box of the campaign you would like to remove and clicking "Remove Selected." Refine the list of emails within the campaign you selected in the previous step. If you do wish to customize this list, use the left column "Emails" to add to the profile list and the right column "Emails Selected for New Profile" to remove. Create a meaningful title for your profile. Complete the scoring profile by clicking the "Build Profile" button. Review the statistics generated for the scoring profile you just created! Note the middle section for "Subject Line" where you can scroll through several measures - clicking directly on each one opens a pop-up window with an interactive bar chart which you can inspect for more details on that particular measure. The black line indicates how many emails you have written at a specific level, the blue bar demonstrates audience engagement. Further down the page is an inventory of all of the emails captured in this scoring profile - which you can sort by clicking the top of each column. This is another opportunity to review and audit the emails that this particular profile features. If you are experiencing issues, please reach out to support@atomicreach.com and we'd be happy to help you resolve this issue.